My career as a professional violinist has been rich and varied. Since graduating from the Royal College of Music and the Guildhall School of Music & Drama, I have performed with numerous orchestras and chamber groups (including the BBC Symphony Orchestra, the Royal Northern Sinfonia, the Moritzburg Festival Orchestra and the Guastalla Quartet), worked extensively as a session musician and sideman (with the likes of Junior Marvin, Stewart Copeland, Sway, Scrufizzer and The Last Skeptik), and performed internationally as a jazz musician with artists including Kate Williams, Jim Rattigan, Liam Noble, Chris Potter, Alex Hutton and Ralph Wyld. After training as a classical violinist with internationally renowned teachers such as Dr. Rimma Sushanskaya and Daniel Rowland, graduating from the Royal College of Music with a first class honours degree, I later took an interest in jazz, studying at the Guildhall School of Music & Drama at masters level, with professors including Chris Garrick, Robbie Robson, Byron Wallen & Martin Hathaway. I am also an active composer and producer, writing for my own groups and others, drawing on my interests in jazz, world, folk and classical music. From 2013-2015, I studied South-Indian violin with Europe's leading exponent of the tradition, Dr. Jyostna Srikanth. 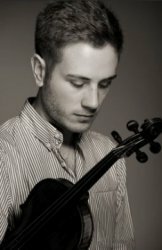 I have taught extensively as a private violin teacher, beginning in Birmingham in 2008, continuing in London, and now in Newcastle. I have taught students of all ages, from three upwards. I have also been on the faculty of many music courses and summer schools, specialising in orchestral, musical theatre and jazz training, including several years working at King Edward's School, Birmingham, Summer Schools. I am a regular instrumental tutor at the Stoneleigh Youth Orchestra in South West London. Part of my undergraduate degree at the Royal College of Music involved working with primary schools, creating workshops tailored to the ages and interests of the pupils. As reflected by my background in a range of musical disciplines, I find it important to encourage an open attitude to different styles, techniques and methods of learning. Together with the student, I try to craft an approach which embraces their interests whilst also strengthening and refining the critical skills of the modern day musician. I place an emphasis on the importance of aural training and a conscientious listening practice, but not at the expense of sight-reading ability or other reading-based disciplines. Whether you're more inspired by classical, jazz or another genre, we can find the right path for you to grow as a musician whilst nourishing your love of the music.